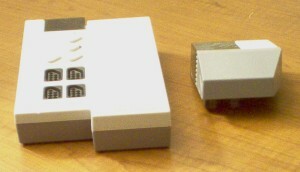 As with any system, the NES had its share of peripherals, though it was the first to truly have a such a large number. Amusingly, most were completely useless and hoped to cash in player's perceived desires to "improve your game! Higher scores instantly!" My collection of accessories was largely acquired through Funcoland before they were bought out and turned into GameStop. Any odd controller was simply marked for less than a dollar and tossed on the shelf, which I then snapped up. Enjoy. One word: uncomfortable. With the cord sticking out of the side this controller is almost impossible to use comfortable. Still, it has turbo and I can probably use it for parts or something when one of my regular pads wears out. This thing is a carbon copy of the controller above, except it's made to resemble a true NES controller more. From a distance, it looks just like one. Upon closer inspection, it has the impossibly stupid cord on the side, and it slightly smaller than a standard pad. I suppose the threat of a lawsuit forced them to make it look different, and the side-cord was their half-assed solution. The Game Genie is perhaps the most intriguing NES peripheral. In the earlier days, I would use it constantly for codes like more lives, but as time went on I started fooling around with homemade codes to produce weird effects and add another dimension to old games. An unfortunate side effect of using it was that the board stretched out your system's contacts somewhat, resulting in premature system-fuckup-age. The Max, barring any Saved by the Bell jokes, was the "other" option to those who didn't want the standard pad or a joystick. It's quite small, even in my average-sized hands, which makes longterm gameplay less than easy. Instead of a crosspad, it has a sliding thumb button, which requires far too much pressure to register a press for my liking. 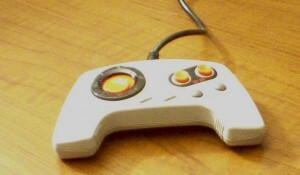 Still, despite my own judgement, I knew many who only used this controller, and it was quite popular. The Acclaim Wireless is not a bad buy. It's quite thick, since it takes 4 "AAA" batteries, but that gives it quite a solid feel. They also threw in turbo switches. The only real downside is that the infrared has to be right on to register, and that can sometimes be restricting. Still, I recommend a purchase if you ever cross them. I cannot imagine anyone truly finding this controller useful. First off, it's meant to be held your left palm, with your middle and ring fingers curling under and resting on the A and B buttons. After that, it's obviously operated like the most unstable joystick you'll ever see. I suppose the rationale behind it was that it was different enough to look cool, thus duping unsuspecting parents into buying this for their kids. 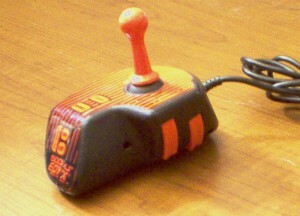 Ever found yourself itching with desire to use a matchstick-sized joystick to play Super Mario Bros. 3? Neither have I. This odd piece is a casing that slips over a standard NES controller. 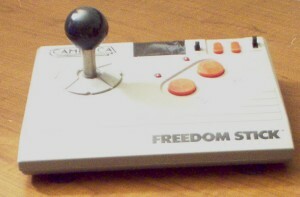 A small stick is then inserted into the hole over the crosspad to form a pseudo-joystick for "arcade" play. Needless to say, I have never bothered to use the SuperController. I must admit that I was never a fan of joysticks to play video games. That explains why I could never pass the second level of Donkey Kong at the 'ole arcade. But for those who feel at home using a stick, the Advantage is your friend. It's got huge buttons, a turbo feature, and a "slow" feature. The hilarious thing about the "slow" feature is that it simply hits "start" many times per second. On games where the pause screen shows you information, or it makes a sound, this can range from annoying to outright useless. Still, it was a good effort and the product is above average in terms of quality. No, you're not seeing double. 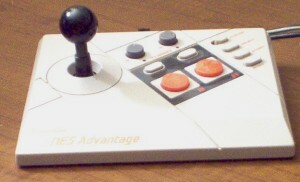 This stick is a cordless clone of the Advantage, made by Camerica. It's quite rare and offers no noticeable differences aside from its, well, freedom from the shackles of being less than 8 feet from your TV. 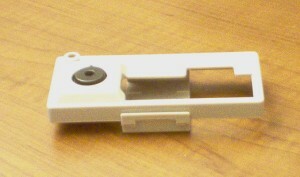 The sensor box that plugs into the system is fitted with a parallel computer cable, suggesting that this was either made really half-assed or that Camerica also sold them on the PC market. 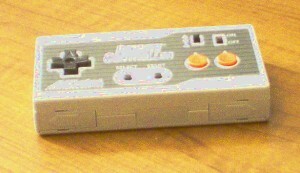 When the NES was re-released in 1993, the controller as well as the deck was redesigned. 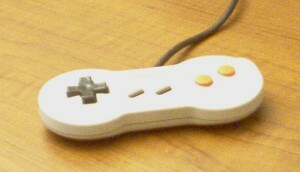 The redesigned controller, known as the "dogbone" because of its shape, was intented to mimic the SNES controller with its angled buttons and curvy shape. As with the Max, it's not quite large enough for my liking, although it's quite comfortable otherwise. Nintendo still sells them brand new at nitendostore.com. 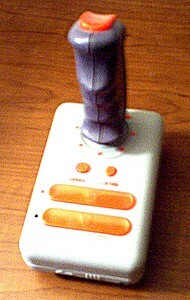 The Satellite is similar to the Fourscore in that it allowed simultaneous 4-player action, but in a cordless manner. The value nosedives quickly when one realizes that it takes six "C" batteries, and the selection of 4-player games is quite thin, save for the excellent Nintendo World Cup. This piece is not even a true joystick. 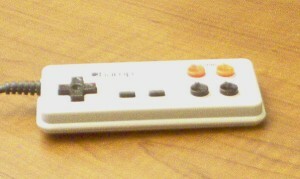 You insert a controller in the front and slide the door closed, and when the stick and buttons are operated, it pushes through and makes the moves on the controller. I don't think I've ever thought that I could play better with a joystick, let alone this hackish attempt at one.